Life is a balance. A delicate one at that. After decades of aiming high, how does one gracefully readjust one’s sights? Just last June I was flying high. 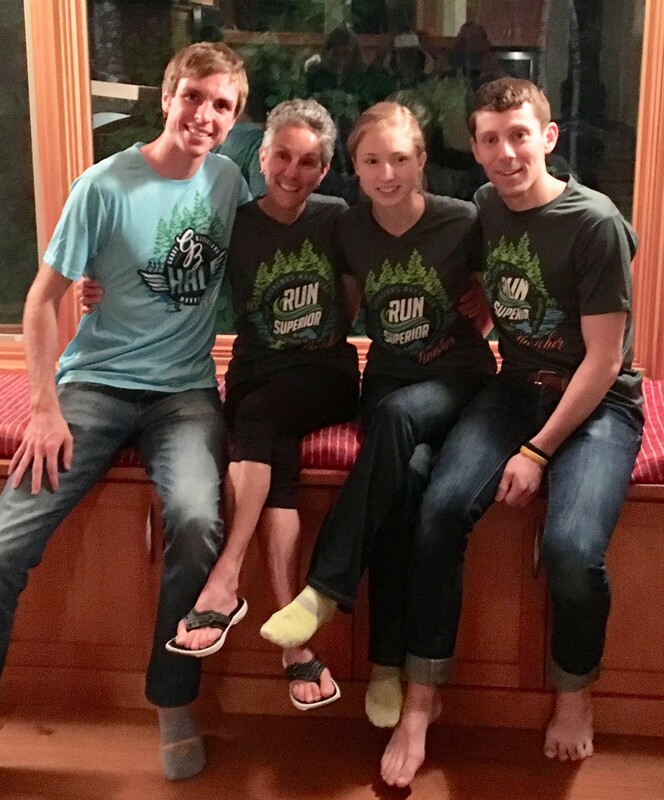 I had qualified for the Boston Marathon, along with my son Erik, his wife Katie and her cousin Brendan. 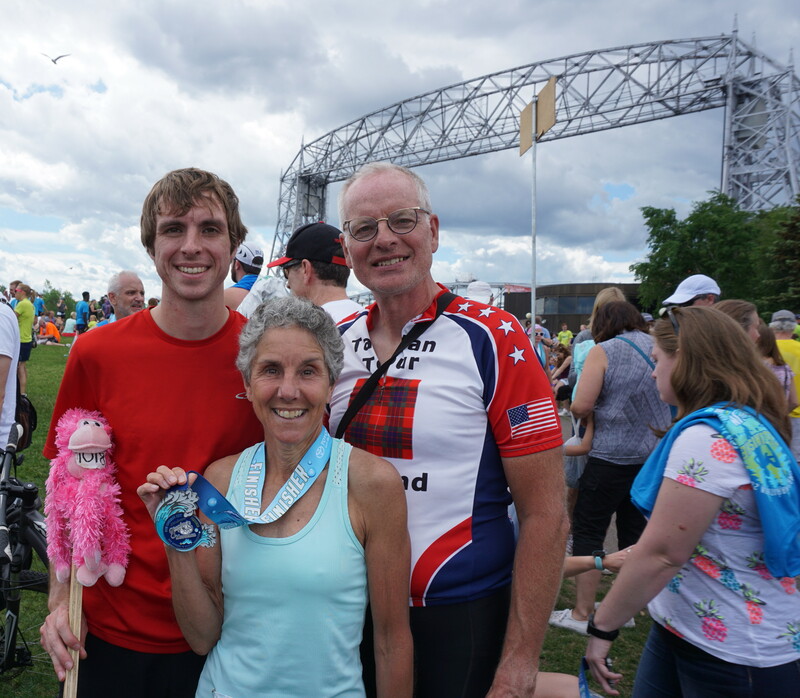 Conditions at Grandma’s Marathon were nearly perfect, propelling each of us down the shore of Lake Superior to cross the finish line with good margins to secure us a spot in that most prestigious of marathons. Swept away by the tide of our victory, our quartet vowed to run Boston. Plans were made. We found housing and received our confirmation emails for the race. All looked good for a spring run. Until it didn’t. Pain, injury, arthritis and bad running habits all linked arms to throw a wrench into my training. Weeks of rest and cross-training turned into months with no improvement. Winter stepped in and obliterated the Lakewalk with snow while temperatures plummeted deep into the negative range. I knew from experience that training for Boston in the midst of winter was a challenge, but this was ridiculous. The ambiguity hung over my head for months. 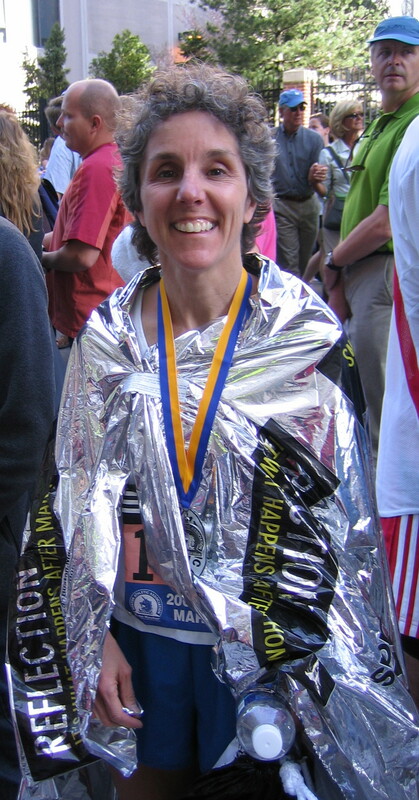 One week I’d feel hopeful and set my sights on “just finishing” in Boston. The next I was pragmatic and knew that the time to adequately prepare was waning. On one hand I’d done it all before. Twice in fact. First on my own, to celebrate turning 50. 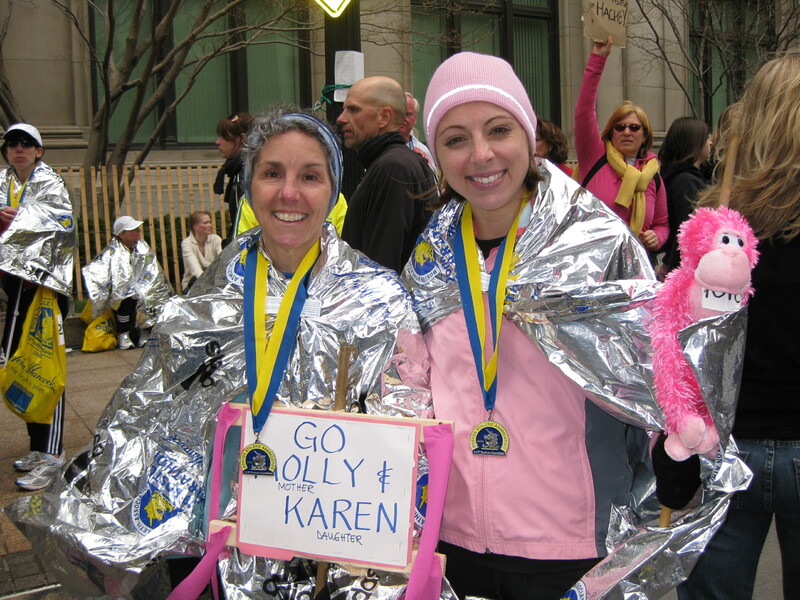 The second time I crossed the finish line hand-in-hand with my daughter, Karen. On the other hand, this was a chance to run it with my son and his wife and share in their joy. To prove I could still do it. In my journey, I sought plenty of advice. Confiding in my daughter, I poured out my dilemma, that I was considering dropping out of the race. “Oh Mom!” she sighed. “That means admitting you’re getting old!” It wasn’t what I expected at all. But her uncensored sentiment revealed something else. She perfectly mirrored my own mother’s unwavering belief in me. I smiled to realize that the generations had flipped, and the void left by my mother eight years ago had just been filled. Oddly enough, just as I felt I was turning the corner through physical therapy I also knew the answer. This wasn’t about proving anything. It wasn’t about getting old. It was about the long run. Literally. It was about healing, gaining strength and building myself back up in order to continue to do the thing I love. Running. For years to come, not just one day. It’s not easy conceding to reality. Come Boston Marathon day I know my heart will twist as I follow Erik and Katie out there on the race course from a distance through text alerts. I’ll wish I was there, doing it. But if it means running with my grandchildren and staying active into my real old age, then I made the right decision. It’s not giving up. It’s letting go. There’s a difference. There is a fine line between passion and obsession. Sometimes the only difference is who is describing the behavior. My passion for exercise and fitness is hardly a secret. A day without pushing my body makes me feel lazy and crabby. Rich knows. He calls it obsession. Second only to the activity itself is my compulsion to track it all. The notes on a small calendar have long since been replaced by a Garmin GPS watch and SportTracks on my PC. Through the wonders of technology I can see at a glance just how many miles I have run and cycled and the kilometers I have skied over the days, week, and years. It’s beautiful. I thought I had it all. Until my birthday. Recognizing that I couldn’t track my lap swimming with my Garmin, Rich gave me a Moov Now device. 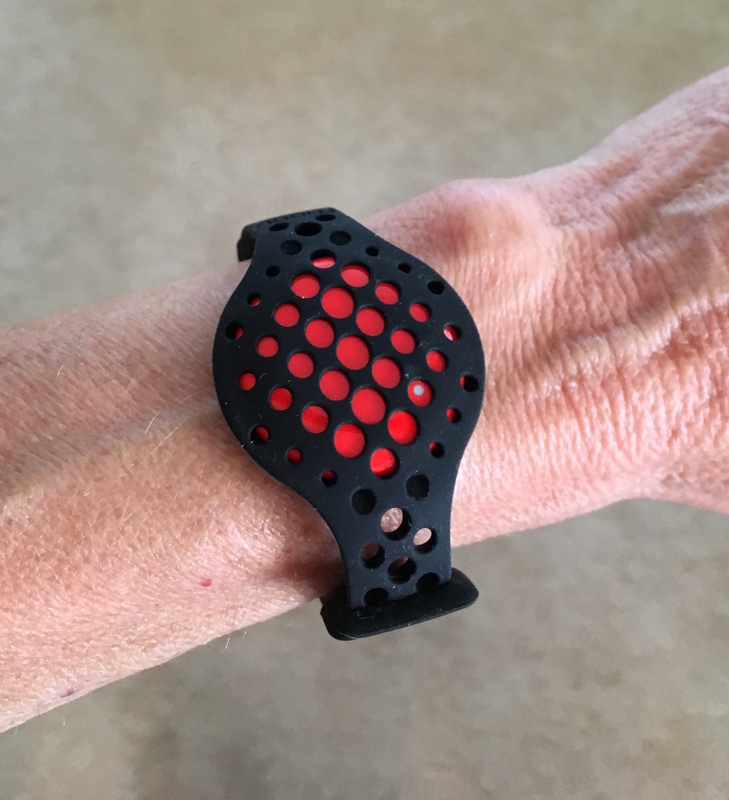 The little red button slips into a flexible rubbery band and is totally waterproof. I failed to see how it could track my swimming, but gave it a try. I downloaded the app on my phone, paired it with my device and pressed “start” while still in the locker room. Doubt lingered. I barely felt the light band around my wrist as I swam back and forth, back and forth. Ok, for 2 miles in the pool. After showering, I retrieved my phone and clicked End. When the data finished downloading from that red button, I took a gander. Wow. It knew everything. It knew exactly when I started swimming, what stroke I was swimming, how many laps I’d done (2 more than I thought), how long it took me for each flip turn, how much time I was actually stroking, and when I finished. It would have recorded rest time, if I’d had any. Averages were calculated for stats I couldn’t even recognize. It was almost creepy. But not enough to stop me from studying the results. From the lap by lap graph, I could see how my flip turns took longer near the end – documenting that slight pause I knew I was taking as I tired. My Distance Per Stroke average was below the “ideal range” so it gave me two paragraphs of coaching advice for improving my efficiency. At its most basic level, it kept me honest if I lost track of my laps. But that wasn’t all. Removing more gift wrap revealed a pair of spur clips for my running shoes, with LED lights. 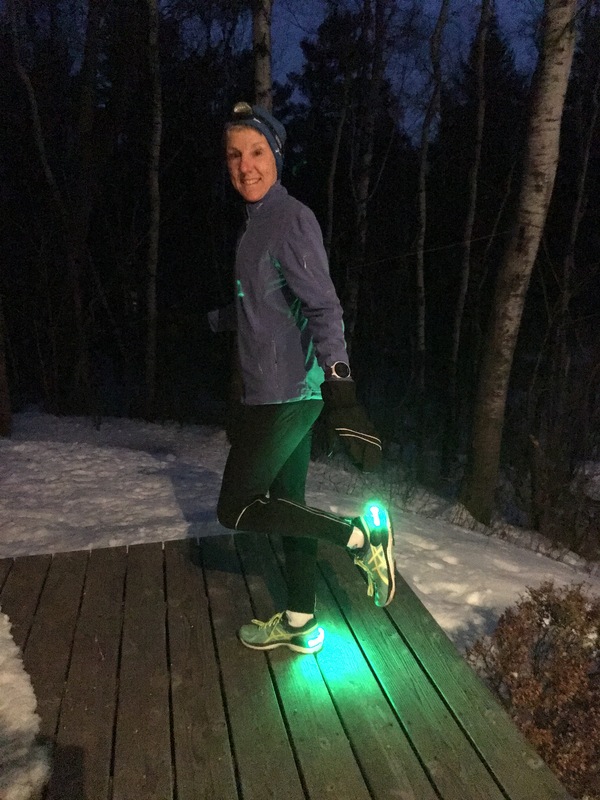 I couldn’t even feel them when I ventured out in the dark on my next pre-dawn run. But Rich said he could see me all the way down our pitch black road. Hating my safety vest, I immediately took to these glowing wonders. And I sure got noticed on the Lakewalk. I was impressed. These were real winners. So Rich confessed that he had help. Entering something like “gifts for runners” in Amazon’s search box brought up a wealth of options for the fitness obsessed. I guess I don’t really care what he calls it. This fitness geek loves her new toys. It doesn’t seem quite fair to leave off with a post leading up to Grandma’s Marathon and then drop it. While I doubt anyone is losing sleep over how I fared in the race, I somehow feel better at least finishing the tale I started. So here it is. Bottom line: My 10th Grandma’s Marathon is in the bag. I legitimately claimed my Finisher’s t-shirt and the incredibly heavy medal they hung around my tired neck. 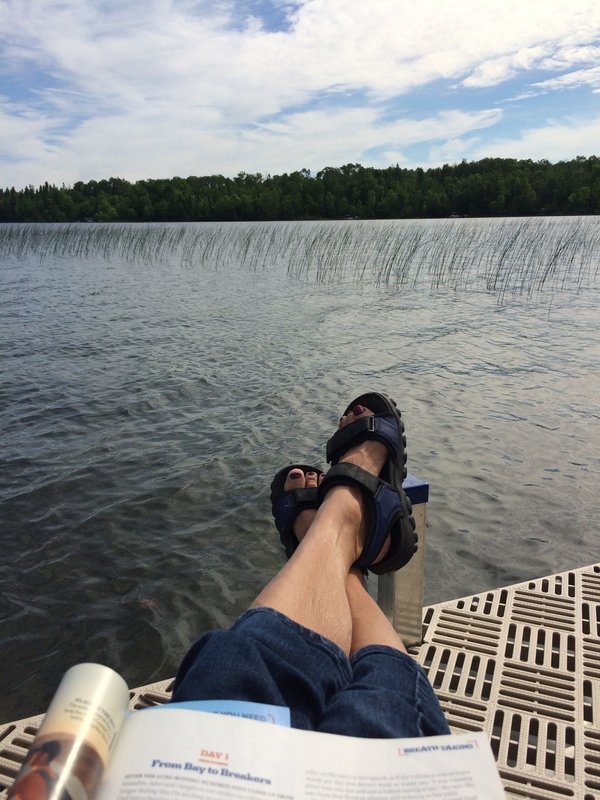 I spent the afternoon relishing that “good tired” feeling and the knowledge that I had done it – and I was done. The race played out much as I might have predicted. It was a cloudy 63 degrees at the start, comfortable for running given a slight breeze to stir the air. The normally welcome sight of the sun was not a good omen. It quickly sent the temperature into the 70s adding heat to the challenge of the race. But in comparison to last year’s black-flag conditions, it was very manageable. I felt good for the first 18 miles. My pace was in the low to mid 9 minute range, which I knew was well below what I should be doing. But as long as I was comfortable I kept it up. I can’t resist the urge to bank a minute or two per mile in the beginning. I began to slow after that, and by mile 21 (coincidentally the max for my three longest training runs) it became a struggle. It’s at that point in most marathons where I feel like I am moving in slow motion. My body is barely moving forward. My legs are like lead. But I persist. I had a great cheering section to spur me on. Rich and son Erik were on bikes leapfrogging from point to point along the route. Erik rode all the way to the end, catching me circling the DECC and riding along shouting encouragement as I turned the corner for the final stretch to the finish. Rich was there at the end to video me crossing the finish line. Never discount the value of family support! I finished in 4:17:15. 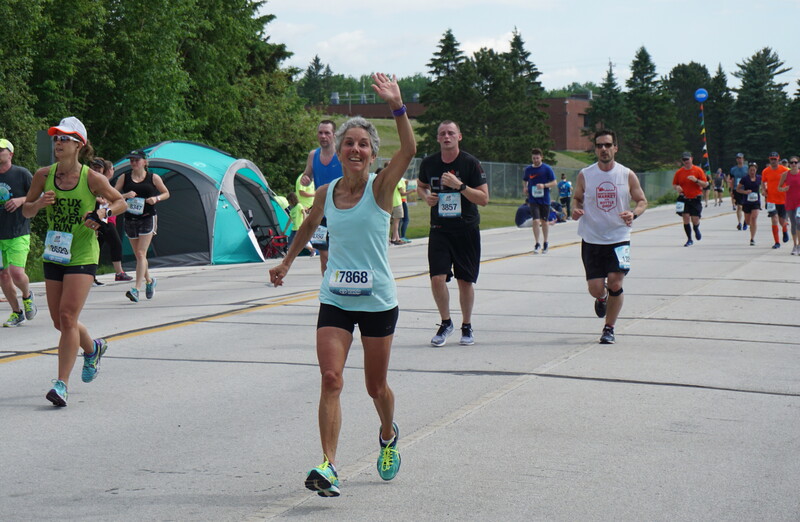 I count it as a victory in many ways – I beat last year’s time, I averaged 9:50 minute miles, and it’s a Boston Qualifier (being old is a huge benefit). But mainly because I felt good about doing it. This makes 18 marathons overall. Somehow I just know there are more in me. I’m not finished yet. The hardest part of training for a marathon is refraining from running. At least for me. After all, in my view doing a marathon is the perfect excuse for running copious numbers of miles. It’s all the justification I need to feed my exercise obsession. While I may not enjoy every step of my long training runs, I do love the feeling of building strength week after week and the sense of satisfaction completing those 21-milers. I no longer use any particular training plan. By now, after 17 marathons I have figured out generally what works for me, and loosely follow that. I’ve made peace with my 60+ years and the inevitable slowdown in pace. Throwing bicycle touring into my repertoire has generated additional irregularity in my training. Since I can’t seem to kick the marathon habit, I’ve learned to adapt and become much more flexible in my approach and my expectations. As long as I’ve done enough preparation to feel I can run 26.2 without issues, I’m game. So marathon week is a particular challenge. I know it’s time to cut back my miles. Intellectually I understand the need for rest days. My body deserves some downtime to prepare for the upcoming explosion of exertion it will take to get from Two Harbors from Duluth. But my mind resists. I’d so rather be out running. Enter the cabin. There’s no better place to chill and relax. I spend my final two days prior to Grandma’s Marathon with the lake in view. It’s a place I can allow myself to alternate between reading and snoozing outside on a sunny afternoon. My favorite morning routine is an early run, a brisk swim and a leisurely breakfast on the dock while perusing magazines. Today it’s barely more than a short jog, a brief dip in the lake and extended coffee time pouring over 8 year old issues of Runners’ World. Tomorrow I can release all this pent up energy. I tell myself I will make up for all the missed miles when I toe the start line and head down the Scenic Highway. I will be grateful for the rest days when I begin to flag. I can feed my passion all I want in the days following the race. For now, I must gracefully concede to my marathon taper. It's a rough life. But I'm managing. I sit in a wooden rocker in the mottled shade of the trees, studded with sleeping monkeys. Draped over high branches, their limbs hang limp. They are carefully balanced yet secured by the end of their tails as they slumber through the heat of the day. I see seven in one tree alone. An iguana saunters by and scurries up a tree. Rich has seen a much larger one. A local named Dino. I'm sure I'll catch a glimpse eventually. 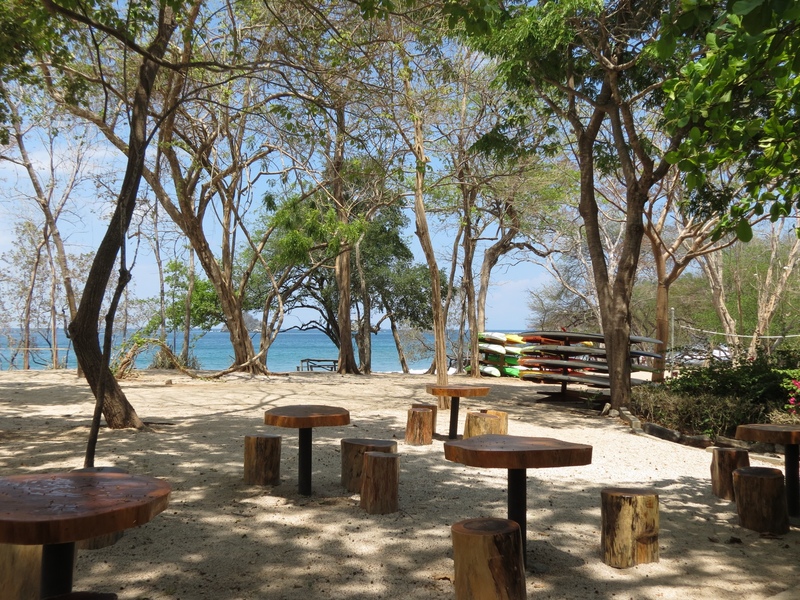 Out front, beyond the colorful racks of kayaks and paddle boards, the ocean glitters in the sun. The water is an impossible hue of blue, only rippled by the wind then heaving and cresting into foamy white breakers against the shore. Paradise indeed. 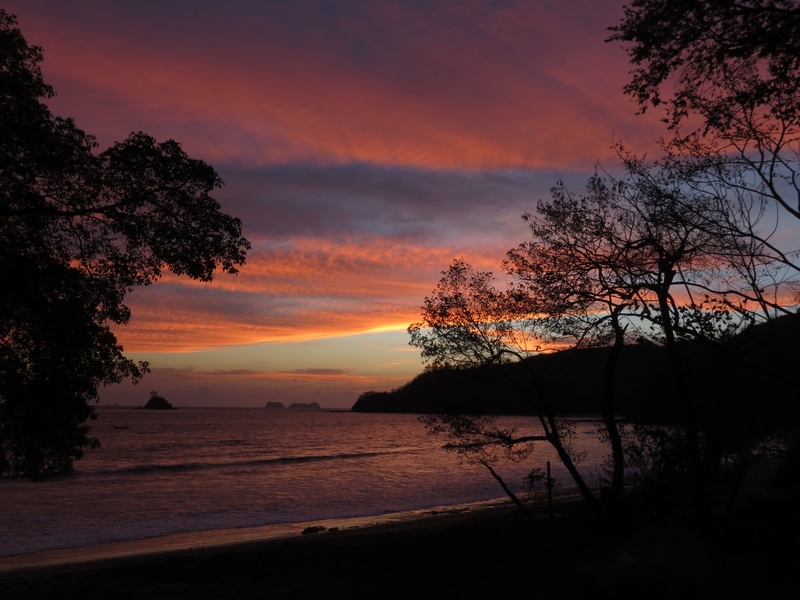 Las Catalinas is a mecca for outdoor enthusiasts on the Pacific coast of Costa Rica. I count myself under that label, but here I am compelled to reconfigure my exercise fanaticism. I arrive open to trying new sports, to make the most of the local offerings. But I'm off to a rocky start. Mountain biking and I don't get along so well. Even on my second attempt I feel my psyche getting more of a workout than my body. But trading wheels for running shoes, I suddenly find relative safety on those same trails. Funny, I never liked trail running before. Now I relish my new activity and still get the amazing views. The bay calls out to me, and I find it calm enough for distance swimming. It sure beats lap swimming in a pool. When the wind picks up, Rich and I try out boogie boards. We manage a few good rides on the waves and do a lot of floating on the swells. I see a kayak and a stand up paddle board in my future. Evening comes quickly here. Sunset is around 6:00pm, and the lingering colors may last 20 minutes longer. Then darkness descends. 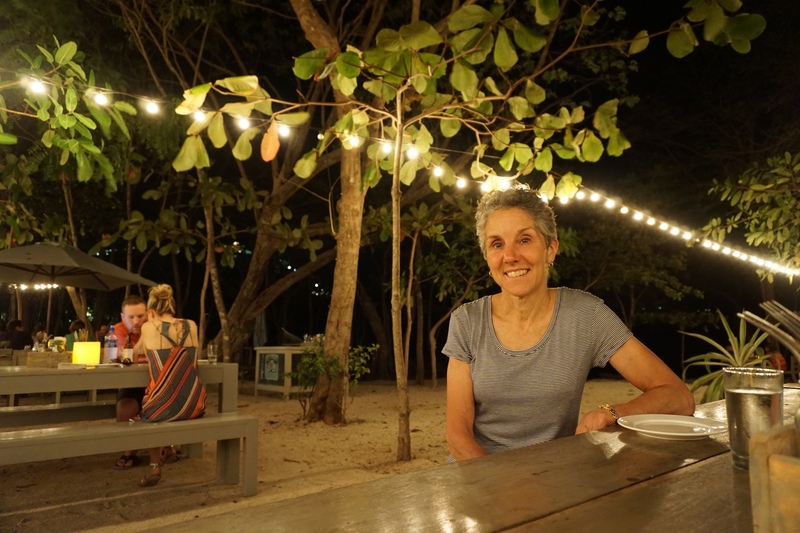 The temperature moderates and a nice breeze comes off the ocean, perfect for outdoor dining on the beach. Welcome to paradise. I think I'm getting the hang of it here. You won’t find this training program in any marathon guides. In fact, I don’t recommend it. But for the second year in a row I am destined to follow it as I prepare for Grandma’s Marathon. Finish skiing the Birkie at the end of February, and trade cross-country skis for running shoes. 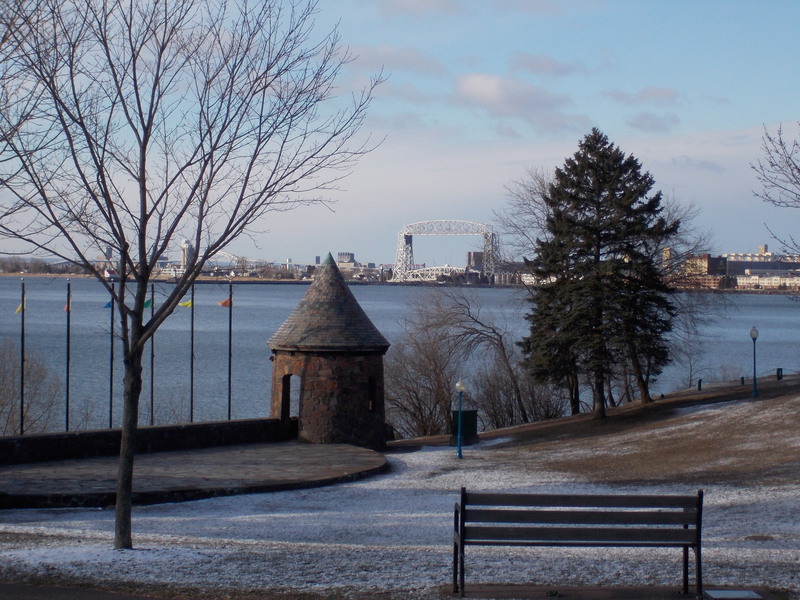 Brave the remainder of winter in Duluth, training hard and working in several 20-milers. Feel good about increasing my pace and gaining distance endurance. Halt! Stop running for an entire month. Pack up the bikes and fly over to Scotland with my husband, Rich, and cycle around the countryside for three weeks. Plenty of hill work as we pedal through the Highlands. Loads of endurance training as well chalk up several 50 mile days in a row. Endless carbo loading as we endeavor to replace calories burned. But not a single mile on my feet. Re-enter the Northland with exactly 2 weeks to go until race day. 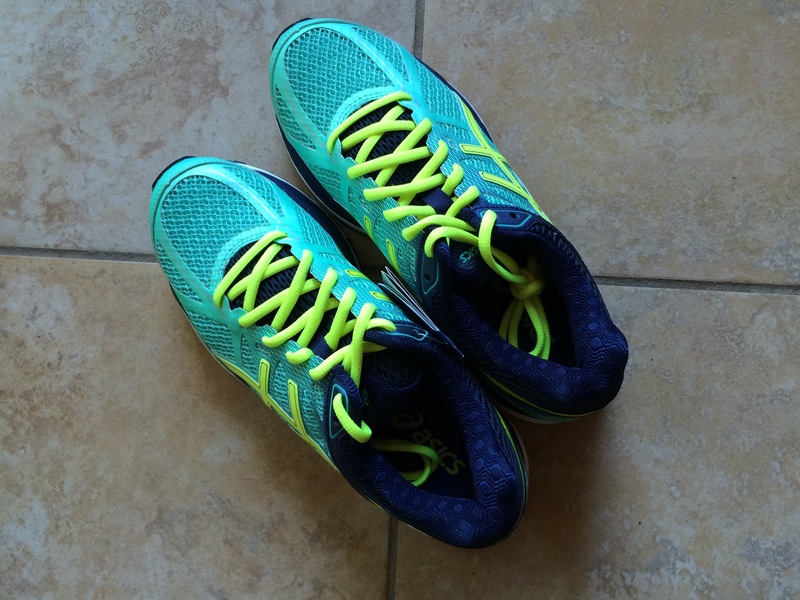 Order new running shoes and cram in the miles. Start with 8, work up to 13 and then 18 in just over a week. Ignore the burning thighs. With 5 days left before the marathon, begin the taper. Whew, almost there! It’s not like I didn’t plan for this race. My son, Erik, and I hit the Grandma’s Marathon site the day registration opened and signed up. We proudly wear our 40th Anniversary marathon jackets. I was sure I could train for a good race this year. Enter my creative husband, who dreams up cycling tours. Marathons notwithstanding. 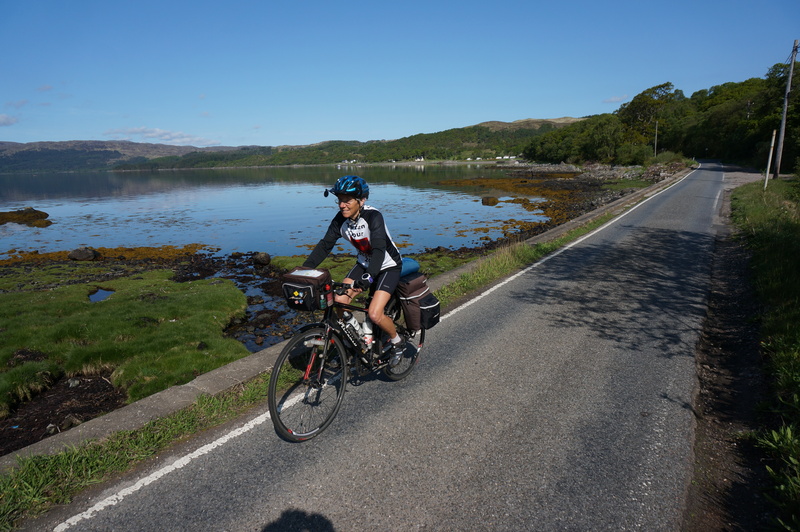 Who was I to turn down cycling through the Scottish countryside? Life is full of interruptions. This one was entirely worth it. I’m back on the program now. Bring on the marathon! It’s early but all the regulars are out there. My morning running ritual takes me down the Lakewalk day after day. There I enter my world of the familiar. I know I should vary my routine, and I do work in some hills or head up the shore periodically. But my feet just naturally lead me to the Lakewalk. The route is always the same, but the experience never is. On the grim, cloudy and windy days, I nod to my fellow runners as we pass. We exchange knowing glances, acknowledging the brutal headwind, the chill of the air. We share the same rugged determination. We are out there, no matter what. When the sun shines and the lake sparkles, our faces reflect the joy of our surroundings. Our “good morning” exchanges ring out merrily. Those are the days when the Aerial Bridge beckons irresistibly, drawing me further down the Lakewalk to its terminus in Canal Park. Ten miles turn into 13. But it’s worth it. My trusty companions on the Lakewalk punctuate the miles yet loosen my brain from focusing on the rigors of my run. Cyclists pass on their way to work, warning me with the sound of their tires or a cheery ring of a bell. Dog walkers are always good for a “hello” and seem to have only beautiful and well mannered pooches on the end of their leashes. Fellow runners whiz by in both directions, but usually with a wave of encouragement. And then there’s Arley. A fixture on the Lakewalk, his presence brightens anyone’s journey. I first see him walking, coffee cup in hand striding purposefully at an early hour. Next, he passes me on his bike, destined for the end of Park Point and back. White hair flying out from under his cap, always with a chipper greeting for me. At times he accompanies me on his bike, spinning away the miles with conversation as I run. 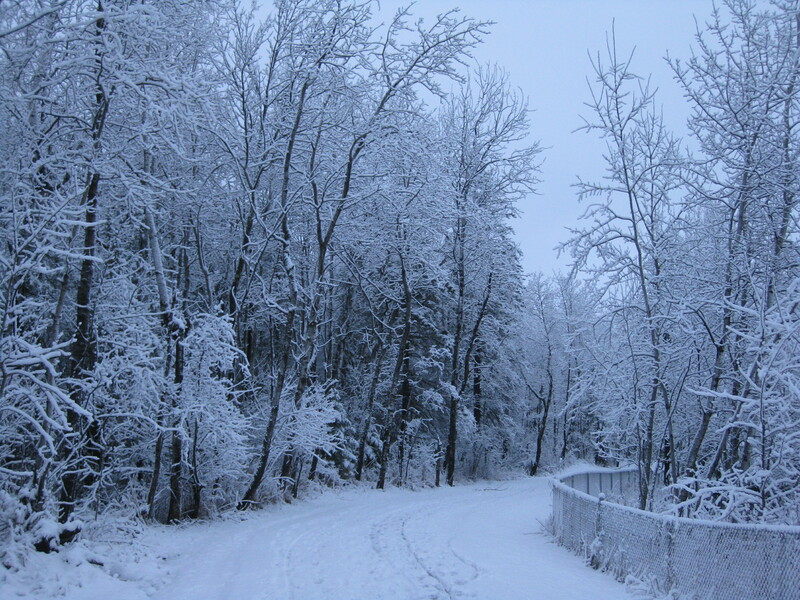 When the snow flies, I can count on his having cleared the portion of the Lakewalk adjacent to his house. 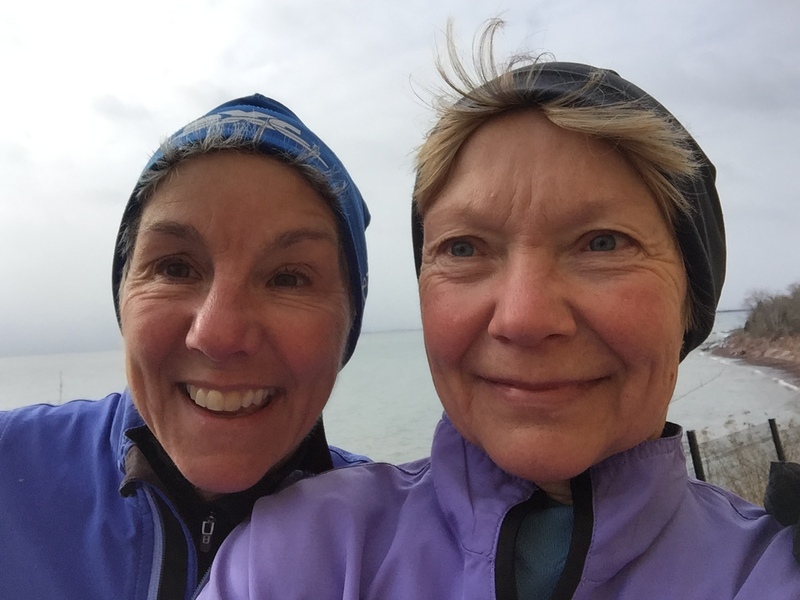 It was the Lakewalk that introduced me to a kindred spirit and running friend, Arlene. Perched on opposite sides of an ice encrusted street, we traded encouragement as we approached. Our steps slowed to a walk, one greeting led to another and soon we were trading phone numbers to meet up for our next run. 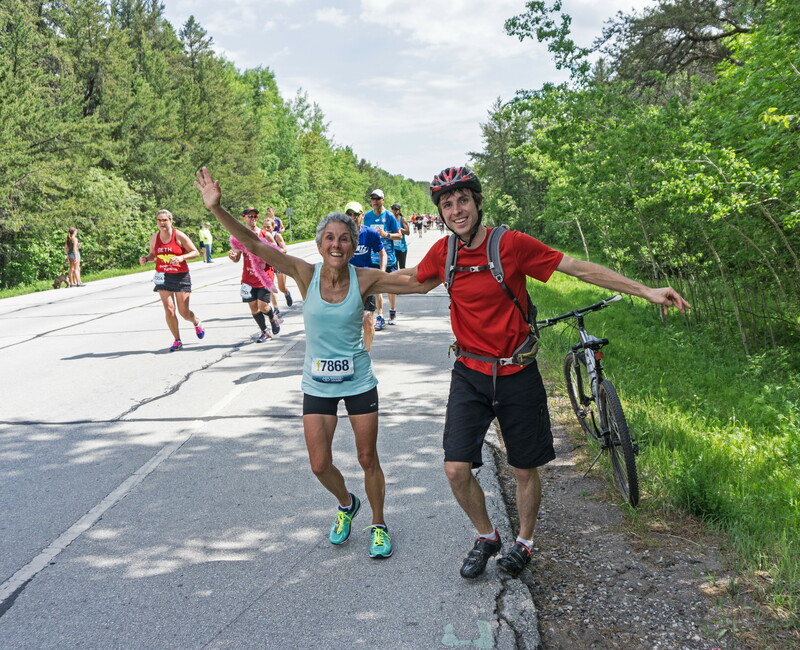 Where else might I meet another passionate running enthusiast and heart-felt friend? Barely a day goes by that does not find one or the other or both of us treading the Lakewalk. Admittedly not all Lakewalk encounters are friendly. Passing through the wooded area just past East High recently, a dark form materialized just ahead. A tall figure wedged between the fence and a tree turned out to be an upright bear, attempting to scale the fence with his hind claws. I’m guessing it was the inhabitant of the 36th Avenue culvert, having wandered away from his den. Passing in a hurry, a quick glace back led me to believe he was perched atop the fence. I wished I had a camera with me, but perhaps it was better that I didn’t linger. It was very thoughtful of the City to extend the Lakewalk to our neighborhood just as we moved in. And the subsequent addition of the tunnel under the highway was equally welcome. Every morning is a good morning on the Lakewalk.